Want to grab more useful links through the week? 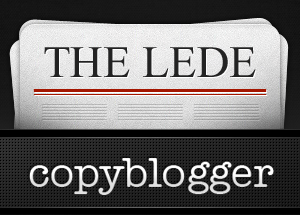 Follow @copyblogger on Twitter. If you’ve ever wondered what your content strategy has in common with the way stand-up comedians develop their acts, this one’s for you. Hint: it’s no joke. If you have a difficult time saying “no,” I suggest you say “yes” to the powerfully simple advice Ms. Heyward delivers in this article. It’s possible to formulate reasonable conclusions as to why certain content gets spread around online through simple observation. In this article, Ms. Seiter commits to taking those conclusions even further … by naming them. Hint: it’s all about ourselves. Content marketing wasn’t invented yesterday. Try decades ago, before scrappy startups were publishing useful, relevant, entertaining content to the web — before there was a web. In his Forbes.com debut, Mr. Clark tells a fascinating story of a Depression-era company with a big marketing problem, and how they solved it. Don’t fear the hype. Google+ is (and will remain) an inevitable part of your content marketing strategy. Use this exceedingly useful post from Mr. Bulygo to setup, optimize, and benefit from a Google+ page for your product or service. This is not a review (or even an endorsement) of Mr. MacLeod’s new book. I haven’t yet read it. It’s more an endorsement for much of what Mr. MacLeod has already done. You see, when I was struggling to figure out this online thing years ago, he was there for me, on his site, giving it all away. I’ve never met the man, but he’s still here, still delivering wisdom, strategy, and delight. So, if this “little love letter to the blogoshpere” is even half as good as what he’s done already, I’ll put my money down for it. If you make and publish content online, I think you should too. I missed the Brian’s post on content marketing, so thanks for sharing that one. I am always looking to keep expanding my knowledge when it comes to content marketing so this was really fantastic stuff. Have a great weekend, Robert. Just bought Hugh MacLeod’s book. It’s a short, fun read and helps get you motivated to create. As Hugh say’s “This is a book about freedom”. Enough said! Great book. Robert, wonderful resources. That is the best guide I have seen regarding marketing you business on Google+. Thanks for the links. Robert, I love the headline for this post. Nice work.